This is a private tour with a chartered van and guide. With a local driver and a licensed tour guide, your travel in Tokyo area will be full of special experiences. This tour is operated with guides from our partner company Field Trip +. The outer Tsukiji market consists of a few blocks of small retail shops and restaurants along narrow lanes. Here you can find all sorts of food-related goods, knives and fresh seafood. 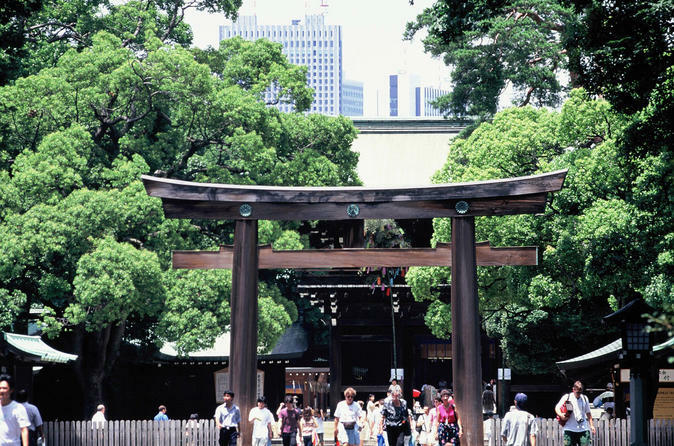 Meiji Shrine is dedicated to the deified spirits of Emperor Meiji and his consort, Empress Shoken. The spacious shrine grounds offer walking paths that are great for a relaxing stroll. The focal point of Harajuku's teenage culture is Takeshita Dori and its side streets, which are lined with many trendy shops, fashion boutiques, used clothes stores, crepe stands and fast food outlets geared towards the fashion and trend conscious teens. Shibuya is one of the Tokyo's most colorful and busy districts, packed with shopping, dining and nightclubs serving swarms of visitors that come to the district everyday. Shibuya is a center for youth fashion and culture, and its streets are the birthplace of many of Japan's fashion and entertainment trends. Akihabara is famous for its many electronics shops. In recent years, Akihabara has gained recognition as the center of Japan's otaku culture, and many shops and establishments devoted to anime and manga are now dispersed among the electronic stores in the district. Asakusa's main attraction is Sensoji, a very popular Buddhist temple, built in the 7th century. The temple is approached via the Nakamise, a shopping street that has been providing visitors with a variety of traditional, local snacks and tourist souvenirs for centuries. *Other places can be included in the itinerary upon your request.